Happy Halloween Week! Right here at ALWAYS in the MIDDLE, I have a review of a scary new book, SMALL SPACES. Click the pirate pumpkin for my creepy review and be sure to check out all the other sites below. The ghoulish gourds will lead you to their site. Susan Uhlig loves the touching SOMEWHERE AMONG, a novel written in verse. June McCrary Jacobs at ‘Reading, Writing, & Stitch-Metic features the Sports Illustrated Kids book entitled, ‘Women Athletes Who Rule!‘. You can also still enter the GIVEAWAY for ‘Sewing Camp Quilts’ before it ends on October 31st. Beth Mitchell at Imaginary Friends has Inkling by Kenneth Oppel. This one has a very interesting premise. Patricia Tilton at Children’s Books Heal is reviewing Louisiana’s Way Home by Kate DiCamillo. Kara Armstrong at Scribbles of an Aspiring Author is reviewing Catwoman: Soulstealer, by Sarah J. Maas. 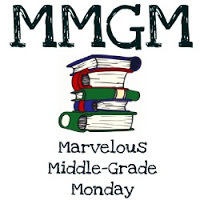 Michael Gettel-Gilmartin is back with a feature on Allison Varnes’ PROPERTY OF THE REBEL LIBRARIAN on Middle Grade Mafioso. Dorine White at The Write Path reviews Dungeons & Dragons: To Catch a Thief. Rosi Hollinbeck has a review of The Boy, The Bird, & The Coffin Maker by Matilda Woods. Be sure to also click on her links for writers as they’re always helpful. Sue Kooky from Kitty Cat at the Library reviews THE SNOW WITCH for this Halloween week’s post. Faith Elizabeth Hough is raving about The Vanderbeekers and the Hidden Garden, by Karina Yan Glaser. Hi Judi, I’m currently only reading books nominated for the 2018 CYBILS Awards. You might look to one of the other bloggers from my MMGM post for a review. Thanks, Greg. Another stellar job!